We didn't do much today except that "Allison" bought Anne a pearl necklace for Mother's Day. There is an International Market across the road from our hotel and for $15 USD you can purchase an oyster. 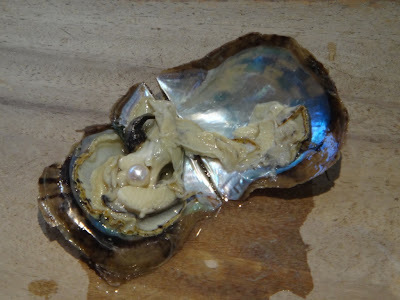 It is a pot luck chance to select a decent pearl from the many oysters they have on offer. Well Anne selected a good oyster and inside was a beautiful pink pearl. We put it into a necklace and wallah a perfect Mother's Day present followed. We believe Allison was looking after us. The attached photo is the oyster and pearl as discussed. We relaxed all day and went to a ballroom dance venue at the local golf club. The people are very friendly and made us quite welcome. Tomorrow is an organised tour around Oahu....our pick up is at 0830h and will take about 6 hours. Cheers.